Jack Benchakul worked at biotech giant Genentech before he got into coffee, eventually trading in his work on cancer-fighting drugs for a brick-and-mortar coffee shop in LA’s Chinatown. 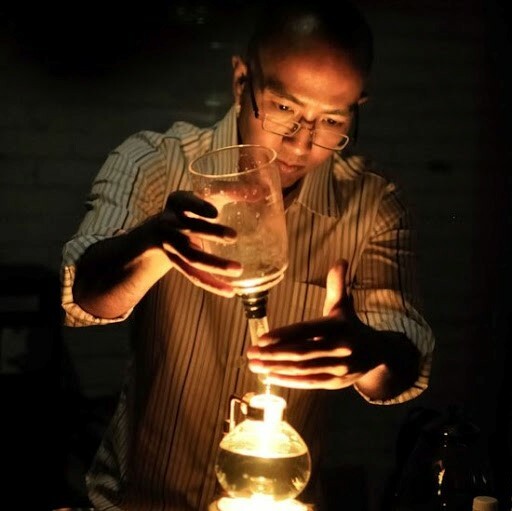 The name of his coffee shop, Endorffeine, is one example of how he brings his scientific background into his love for coffee. What hooked you on coffee? My coffee epiphany occurred during my days as a pastry cook. One of my colleagues went for a coffee run, and brought me a cup (from Blue Bottle). I immediately reached for cream, and she slapped my hand. “Why would you adjust (flavor) before tasting it first? !”, she asked. As a cook, I was very embarrassed. She was right. I took a sip, and felt as if I just drank my first cup of coffee ever. It was perfect, and it didn’t need any adulteration. The coolest example of science in your coffee? It may not be the “coolest” example of science, but I appreciate the manner in which the material makeup of different drinkware will alter the coffee product. For example, no two glass vessels will produce the same tasting brew, because the (manufacturing) process differences between two different glass companies can alter final pH of the coffee solution. So, different vessels can have an effect on flavor. Coffee!…Hands down. It smells great, tastes wonderful, gives me energy, and keeps me alert. A cup of coffee is approximately 94% water, so it proves the adage that good things come in small packages. With over 800 (known) aromatic compounds, it is one of the most complex foods on the planet. It can be consumed alone, or paired with an infinite number of other edibles; coffee is an extremely versatile product. Solubility…as it pertains to coffee brewing. If you can command the forces of temperature, pressure, agitation, and time, then you can brew a proper cup of coffee. Advancements in science and technology will allow more coffee farms to function sustainably, while reclaiming process water that would otherwise pose a toxic threat to the surrounding community. Coffee roasters will continue to increase their understanding of roasting, and they will be able to achieve more depth-of-flavor with existing roast profiles. New brewing methodologies will enable baristas to coax more desired solubles (and flavors) into the cup (while omitting unwanted flavors). Eggs, butter, strawberry preserves, Cowgirl Creamery Mt Tam, and takeout from Sapp Coffee Shop. The French Laundry Cookbook is a permanent fixture on my nightstand. One espresso, followed by a cortado. Tags: barista, biochemist, coffee, eggs, Endorffeine, Jack Benchakul, profile, Q&A, scientist. Bookmark the permalink.